We must bond together as one in prayer of these things. To the letter! NRA. Once again, Brothers and Sisters, we are faced with a tragic school shooting. This time in my home state of Texas. 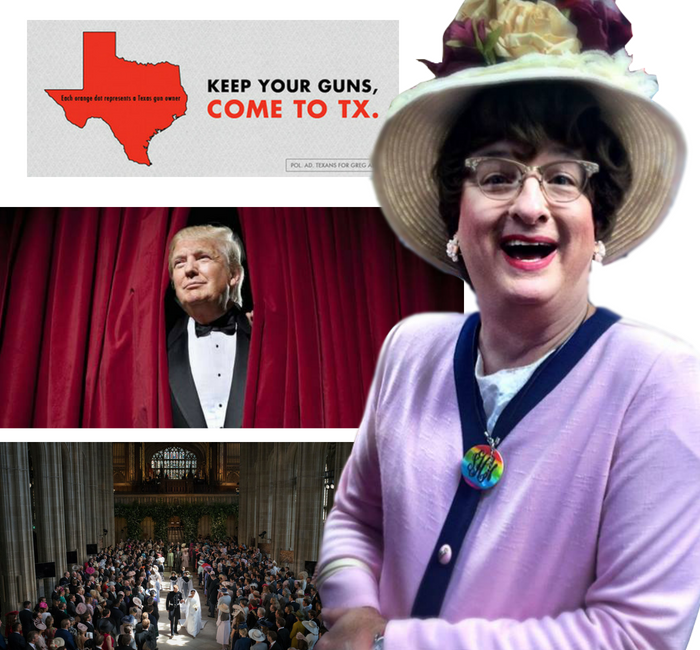 I shall be in prayerful anticipation of how the fine Christian gun owners of Texas are going to respond to this event. Will there be some sort of action on gun ownership from such a large number of NRA members in one state? I fear not. Already our Texas leaders are proposing that the way to solve the problem is to limit the number of entrances and exits to a school so that anyone carrying a gun (illegally) into the building can be searched. Isn’t it amazing how the Lord speaks to these leaders? But be ye not fooled. When God closes a door he opens a window. And if Governor Abbott wants to be truly Godly, he’ll board up all the windows too. Which means there will be no more shootings in schools! Praise the Lord! I guess when an entire student body is wiped out by fire because there’s no way out, the NRA will simply shoot all the makers of flammable materials. And guns will save the day! Bang. DEA. We need to pray about our President’s apparent methamphetamine problem. I realize that there has been no visible proof from the DEA that he has been ingesting this illegal evil, but his actions belie all proof. I have never seen someone so paranoid who hasn’t been kneeling before a crystal altar. And anyone who tweets at the ungodly hours he does is CLEARLY not getting much sleep. It is my prayer that the White House maids will sew all the curtains shut, lest Donny be peeking out at the Secret Service hiding in the trees. Because, in his case, they really ARE there and that is going to mess with what’s left of his mind. Let us pray. HRH. I must say that I always rejoice when a lovely man and woman commit to a lifetime of marriage in the Lord. (I’m having to come to terms with sodomites and lesbyterians doing it now, but I digress.) Thus, it was with great joy that I observed the pomp and circumstance of the royal wedding this past weekend, peppered with some gospel flair and Babatist preaching. Still, I had few concerns. First of all, couldn’t HRH Harry been less hairy? Is there not a razor in the palace? Secondly, I thought that Sister Markle’s veil was a bit much. Clearly she was inspired by her last CVS coupon receipt. Thirdly, did they have to make the mother of the bride sit by herself? Did she have cooties? And finally, everyone knows I believe in a good hat at church. However, PUT THEM ON STRAIGHT! Cheerio!